As my flight neared its destination, I tried to remember how I felt during my first descent into Addis ten years ago when it was not just my first trip to Ethiopia or Africa, but my first outside of the USA. I would spend a semester with Doane College professor, Betty Levitov, and 14 other students traveling from Addis to Cape Town, learning more than I ever had in any classroom. I remember pouring over a map of the continent during the long haul flight from Washington, DC to Addis, feeling both nervous and excited. I felt similar emotions as my plane touched down in Addis last week, but for different reasons as I embark on my new role as Team Leader for Nuru Ethiopia. Since that initial trip in 2006, I’ve spent the majority of the last decade in Africa. Over the years, I progressed from student to volunteer teacher to drought researcher to coordinating projects at the Jane Goodall Institute in Dar es Salaam before joining Nuru International. I began my work as an Agriculture Program Specialist alongside Nuru Kenya’s Agricultural Program Manager, Tom Nyongesa. As the expatriate team was whittled down to support increased local leadership, I moved to Impact Program Specialist, and eventually Nuru Kenya Strategic Advisor, working alongside Nuru Kenya’s Country Director, Pauline Wambeti. I came into this work the way many do – wanting to make a difference in the world, young, naïve. Despite challenges, failures and many mistakes, I am able to stay in this field by continuing to believe that development work can make a positive impact. I approach my work differently these days—with a tentative, stoic optimism. My time working in-country has repeatedly humbled me. I have realized that increased expertise tends to come with an increased understanding that the causes of poverty and inequality are incredibly complex, shortcuts are few and change is incremental. The first year I worked in Kenya ended in a failed harvest, crop insurance that would not pay out in time to ensure food security and the need to overhaul the way Nuru addressed risk management. It was a difficult time; I struggled with seeing the impacts of that drought on the households I was working for and became increasingly frustrated as I realized there was little I could do to change outcomes that year. Yet, the difficulty I experienced paled in comparison to that of the farmer households who were affected. I continue to keep that in mind—that we exist to serve these farm families, and when things get difficult, they do not have the option to quit. It is okay to talk about how difficult seasons and failures affect both development workers and farmer households, but it is certainly not by the same order of magnitude. Reminding ourselves that those in extreme poverty do not have the option of quitting, changing fields or saying “it’s all too difficult” is what drives development workers to press forward, seek new solutions and fend off cynicism. The truth is, development work often involves taking two steps forward on one day and a step back the next. The path out of poverty is not often linear. For many seasoned development or aid workers, both those who work abroad and those who work within their own countries, reentering the field or taking the next contract is ultimately a conscious decision to take on extraordinarily difficult challenges. Though success in this field is often hard fought, I continue to be amazed by the magnitude of impact when successes are achieved. During my first week in Ethiopia I visited a training for local water infrastructure artisans that has been organized by Nuru Ethiopia Healthcare, headed by Program Manager Zelalem Abera and Program Specialist Kevin Nascimento. Over the last few months, Zelalem, Kevin and their team members have revived community water committees, mobilized resources and conducted training to repair water infrastructure that hasn’t been functional for many years. The cost of this project was relatively low and provided access to clean, safe water for over 1,000 households—some of which were walking hours to the nearest water source. It also produced a team of trained artisans who can go on to fix water sources in other communities. Big impact at a low cost does not imply that problems are simple or easily solvable, but it does mean progress is within our reach. For Nuru Ethiopia Healthcare, it certainly would have been easier and faster to directly fix the pipes and tanks rather than mobilize community buy-in, labor and money to contribute to the project; but that would have been a one-off solution to an issue that needs on-going attention. Now, the communities using the water have the support and skills needed to keep the water flowing. Increasingly, I believe Nuru and other effective development organizations like One Acre Fund and FHI360 are getting it right by understanding and designing for complexity. This movement toward locally led, sustainable solutions drives me to continue working alongside like-minded individuals to build impactful and lasting organizations. A curious thing happened during my last visit to Nuru Kenya: I recognized I was no longer needed. The project had outgrown me and Nuru Kenya could make progress on ending poverty without me. After a disconcerting moment, I remembered this was exactly what we had been working toward in Kenya. I was initially drawn to Nuru because of my belief that development must be driven and sustained by individuals from within a country. As I stepped away from Nuru Kenya, I saw this belief come to fruition. At the same time, I believe we all have something to bring to the table, regardless of nationality. Tom, Pauline and I could all provide long lists of lessons we have learned from one another, because mentorship between expatriate and national team members is not one-directional. Like many complex problems, a diversity of experiences, backgrounds and expertise lends strength to creating solutions for addressing rural poverty. Though my work in Kenya is complete, I don’t see this as a time to walk away. I am leveraging my experience to contribute to new geographies in new ways—thereby increasing my effectiveness as a development worker. During my flight to Addis, I started thinking about what I bring to the table for Nuru Ethiopia. Some standard answers include efficient systems, lessons learned and a seasoned perspective from working in Kenya. Just as importantly, I bring gratitude for getting the experience to work on something I find both meaningful and challenging, a renewed curiosity, an eagerness to tackle a familiar problem in a new context and the humility to know that listening to the Ethiopian team is the lynchpin to success. We must not stand for the status quo and accept that so many will live with so little. We must work to address poverty and inequality regardless of how difficult it may be, regardless that at times we may flounder, and regardless of its effect on our own lives and families. And daily, we must renew our commitment to building something we all believe in together. Team Leader, Nuru Ethiopia — Originally from Nebraska, Amy has spent much of the last few years researching and working in East Africa. After studying biology at Doane College, Amy pursued an MA in International Studies and Environment and Natural Resources from the University of Wyoming. 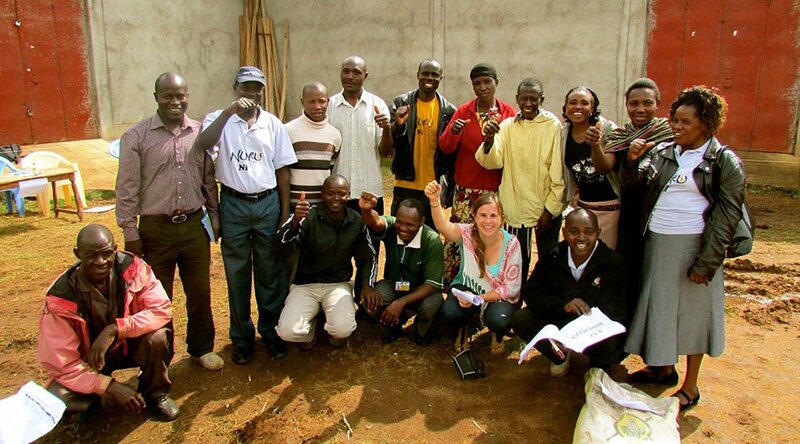 As a graduate student, Amy studied community adaptive capacity to climate change by examining the drought-coping mechanisms used by small-scale farmers in rural Kenya. Prior to joining Nuru, she worked for the Jane Goodall Institute–Tanzania as a project and volunteer coordinator for the Roots & Shoots program in Dar es Salaam. Amy has also worked for the University of Wyoming and the University of Nebraska as a research assistant, the Wyoming Conservation Corps, and in small-scale organic agriculture.